One Mom's Moxie: Funny Friday Photo! I want you all to feel free to share a joke, story or link to their own funny story either here or on One Mom's Moxie Facebook page. Here is Pixie, she is what we call "different" and not like other cats, she actually sleeps on my side, so when I am in bed she crawls up onto my hip and sleeps on top of me. Pixie is special to us, our whole family loves this little kitty like you wouldn't believe. My daughters ( I must admit I helped a little bit) put a pink dress on Pixie and she actually kept it on for a long time! Now I would never condone any cruel treatment to any animal! 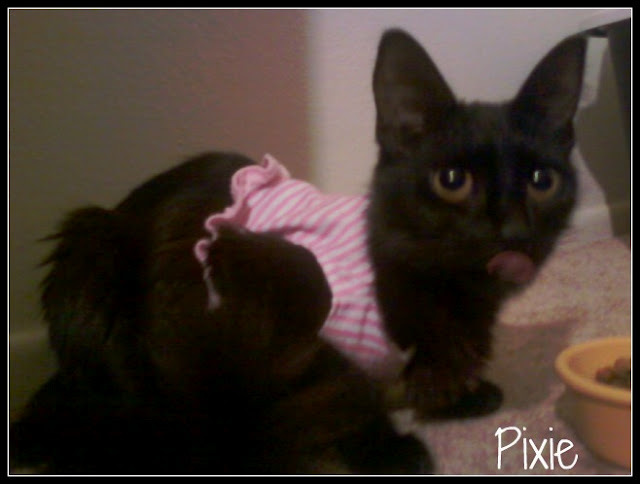 Pixie was not harmed and actually seemed to prance around in this little pink dress. It was not tight or restricting in any way. I snapped the photo right when she was licking her chops, but it looks like she's sticking her tongue out to all other kitty cats that aren't wearing pretty pink dresses! Do you have a funny pet story or photo? Feel free to share it here or on my Facebook page! I would love to put cut clothes on my furbabies...but I would probably not have any eyes in the morning if I did that. They hate anything on them. I even hate collars, lol!